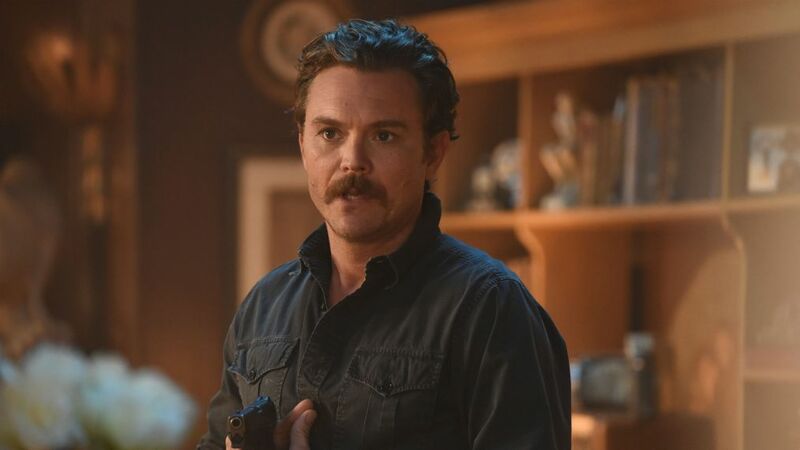 When it became clear Clayne Crawford would not be returning to Lethal Weapon, fans immediately started to speculate about how his character, Martin Riggs, would be written off the show. Well, last night's episode answered that, at least. Tuesday night was the Season 3 premiere of the Fox drama, coming off of a cliffhanger in last season's finale. Last we saw Riggs, he'd been shot in the chest. And as one can predict, he died on the operating table. 'I knew that they had those tapes, and they had been blackmailing me with them,' says the actor. After his partner, Murtaugh (Damon Wayans), rushed a unconscious Riggs to the hospital, it was revealed Riggs didn't survive the surgery. Murtaugh was obviously having a hard time processing Riggs' sudden death and couldn't believe it was Riggs' own brother who shot him (even though the audience knew this to be true). The veteran cop began to spiral out of control and found himself in the middle of a very sticky situation: He intervened in the mob's plan to rob a bank vault by blowing up a subway train. Enter detective William Cole, played by new cast addition Seann William Scott, who uncovered the dangerous plot, and tried to stop it. The two then teamed up to thwart the mob, though the train still did end up exploding. Murtaugh was impressed with Cole's crime-fighting capabilities and requested him as his new partner. The episode was a solid start to the third season but, of course, the Internet had a few thoughts about the way the show handled Crawford's exit.